To preserve natural resources, we recognise the importance of reducing waste along the whole value chain. We are committed to eliminating waste at every level of our operations. We define waste as any material that arises during the manufacturing or distribution stage of a product that is destined for final disposal at offsite landfill or incineration without energy recovery. 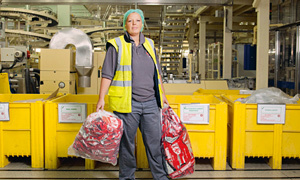 Since 2002, we have almost halved the amount of waste for disposal generated in our factories per tonne of product. We are still on target to meet our 2015 goal of reducing waste for disposal on a comparable basis by 5% by 2015. In 2012, 39 factories generated zero waste for disposal (2011: 22) and more than 82% of the waste generated in our factories is reused or recovered. It will be challenging to achieve zero waste at every factory due to the lack of appropriate recycling infrastructure in many countries, especially for hazardous waste. However, it is our ambition to achieve zero waste for disposal where technically feasible. For example, in the UK, seven of our production facilities have been verified by Bureau Veritas as sending zero production waste to landfill. This is a major milestone towards our target of zero waste to landfill at all our 14 UK factories, including sister companies, by 2015. To add our existing zero-waste sites of York, Girvan and Dalston, our Hayes, Halifax, Fawdon and Tutbury sites were also verified as zero waste in 2012. In 2012, we fine-tuned our reporting of waste and by-product volumes to comprehensively report by type and destination.